PT, no worries. When I said "not constructive" I suppose what I'm getting at is... yes I know the fixed zoom level isn't for everyone, but folks have the choice, and I can't offer any more than that. If I knew a way to fix the pancake effect without breaking zooms, I'd do it. What bothered me about your post was, it's like you were saying that nobody else is going to like it at all... and I hope that's not true. Remember what I told you before, grasshopper: if you love your mod, it was worth making it; if one other person loves your mod, it was worth releasing it. From a gameplay/functional point of view, for me personally, the only thing I miss (just a little bit) is the 1.5X zoom on the obs scope... the new attack scope zoom suits me fine, even if it's not a RL zoom level. And what exactly happens if you add a 1.5x zoom to the obs periscope? Tecnically, if you fixed the waves to look good at 6x, when you zoom out to 1.5x (which is almost null zoom) they should look perfect as well... And even if they don't, you could use a 1x zoom, wouldn't it work? Firstly, the pancake effect happens in reverse i.e. the waves get bigger (huge). Secondly, many graphical artefacts appear all over the place and the game becomes unstable (high chance of CTD). And what if you set the attack zoom to fixed 6x? The double mast values is the only issue? An attack scope fixed at 6X would be useless to high-realism players (like me :p) who get close to their targets. Just throwing some "what ifs" to understand the mechanics, not requesting anything! Ok, I did a quick test with no mods activated. - First, now the sun was flat from all vantage points. I'm not sure whether I've had this problem all along. I have a faint memory of the sun halo working with some mod combination. Maybe with GWX 2.0 and OLC GUI 1.2.1, I'm not sure though. Sorry, not very helpful. Anyway, your fix seems to almost fix it, which is certainly better than a totally flat sun. -Secondly, I did have the hatch mod - that came with GWX 2.1 - installed. However, now that I tested the game with no mods activated, I still had the same problem with the lights. Now that I think of it, I might have had this problem from day one. So, it's most likely either a stock bug or something that came with GWX 2.x. I suspect the former. You've really made such a good GUI that now I seem to start paying attention to little details/flaws that I might not have even noticed before. -Secondly, I did have the hatch mod - that came with GWX 2.1 - installed. However, now that I tested the game with no mods activated, I still had the same problem with the lights. Now that I think of it, I might have had this problem from day one. So, it's most likely either a stock bug or something that came with GWX 2.x. Again, I suspect the former. Thanks. BTW, the sunhalo (as well as the lights inside the sub) can be greatly affected by your AA settings, on your graphics card. If AA is off, try turning it on and maxing it out. If it is on, try turning it down. I might help a lot. On my rig it has a huge effect. I'm not sure if that's "high-realism"... But I'm trusting your judgement. How close would that be? 1000 meters? And how do you manage to attack convoys if you approach that much? Its too hard to scape. During the WW2 they would shoot at longer range, two eels for two targets, or sometimes 4 targets at once, between 2 and 4km away. 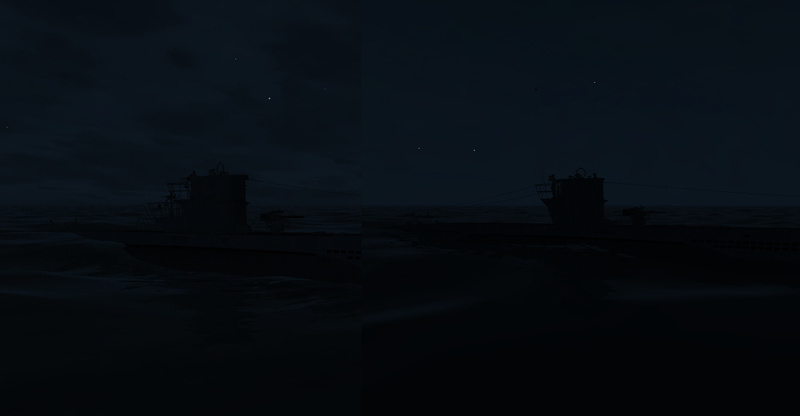 I read about one attacking a destroyer about 6km away, and sunk it! It depends on the ship size, but I tend to shoot from anywhere between 500 and 2500 metres (sometimes more, but rarely). I thought that was realistic but maybe not, who knows? One of the things that I like the most in this mod is the Sky. How did you make it blend in like this! Thanks for a cool mod . I like the dark night very much . The one on the right is OLCE2. I'm mot sure what you're asking about... what blending do you mean? I've just reinstalled everything, SH3, Patch, GWX 2.1 and your Uber (the full monty). I play in a similar style to you so i'm happy with the logic behind the scopes. However, I do have one problem....the FPS is so fast (148) that I can't fine adjust the image in the UZO very well.....i.e. when I hold down CTRL and use arrow keys to rotate the UZO image it moves way too fast...makes using the UZO near impossible for range estimation using yellow vertical marks. So is there anyway of slowing down the image movement when CTRL is pressed ? Also, I have a BFG 8800 GTS so if anyone has a similar card i'd be interested to know what nHancer settings you're using. One thing you can do is turn on vertical sync in the SH3 graphics options. That should help. May I ask, why are you using the arrow keys instead of the mouse? Thanks for the tip, have turned it on in nHancer and SH3. Are there any "tips" with MiniTweaker and scene.dat ...that I could try to "tune up" my night light? Or it is "don't try this at home"... heavily coded. It's certainly not a walk in the park, to be honest. I'm not trying to "guard secrets" or anything daft like that; any modder here will (I hope) testify that I'm normally willing to share any and all info that I have. But the sheer amount of research that I had to put into figuring out all the interactions between all the different colours and colour settings is not going to be possible to convey in a few sentences. Nevertheless, if you're feeling adventurous, I can tell you which files to poke around in (in fact I think I already did, when you asked the same question in the OLCE1 thread ). I didn't play so much SH3 these last days, but made just a quick look at it, and it seem's that you made again some great work !! I plan to use it with my next patrol. It will be hard cause it's realy a whole new GUI and i must learn to use it. BUT : Is it compatible with a 1680x1050 widescreen resolution ? It would be hard for me ( in fact, impossible) to return to a 4/3 ration in 1024 .. I watched your video totorial and i'm really, really impressed Man, you deserve a medal for your work. Amazing !